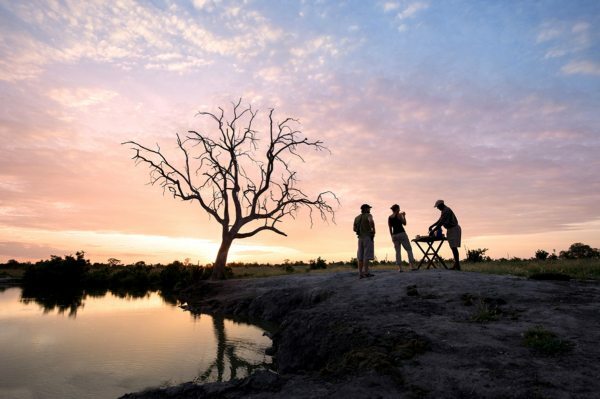 A real mix of landscapes, from the patchwork of wet and dry in Mana Pools to the grasslands and sparse forest of Hwange and the Zambezi in all its majesty at Victoria Falls. 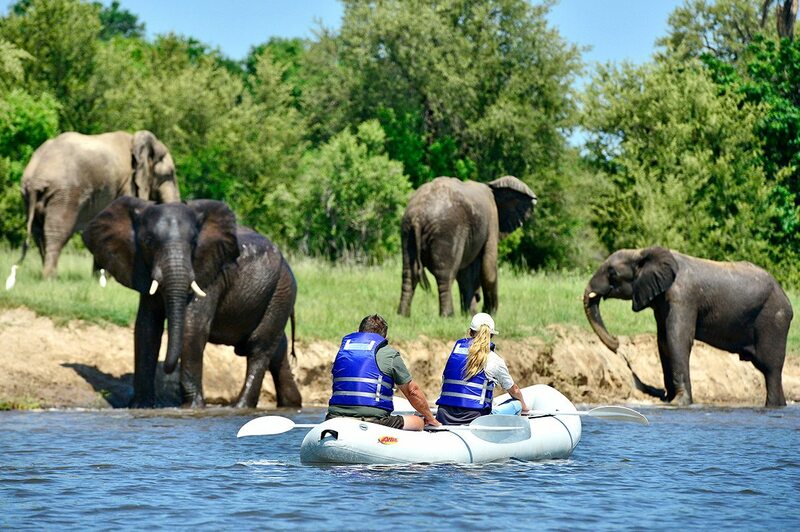 Opportunities to take canoe safaris on the mighty Zambezi, go on game drives beside the Zambezi, have encounters with big elephant and buffalo herds, visit Victoria Falls, cruise the Zambezi at sunset and microlight over Victoria Falls. 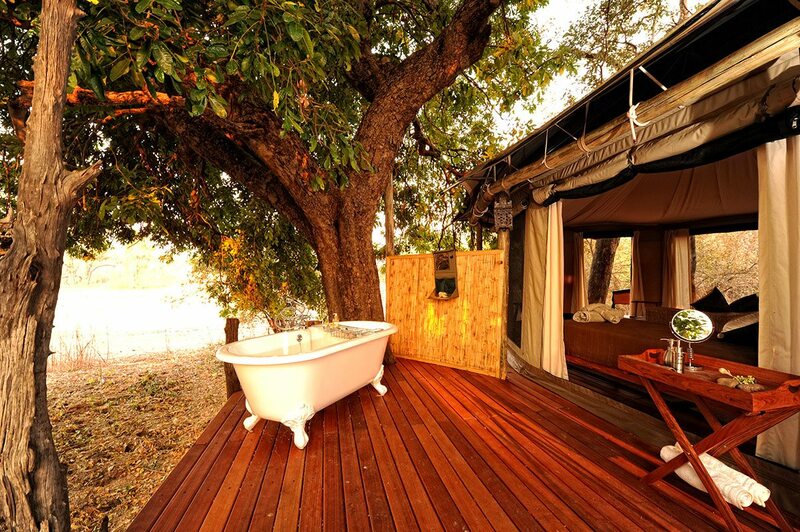 Luxury tented camps with varied wilderness views: Kanga Pan, Kennedy Vlei and the Zambezi River. 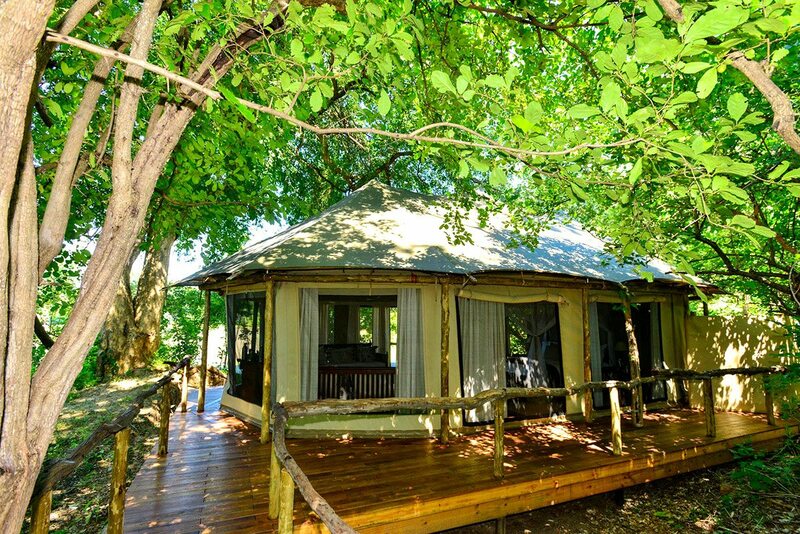 The first two lodges feature shared pools, while each guest tent has its own private pool at Victoria Falls River Lodge. 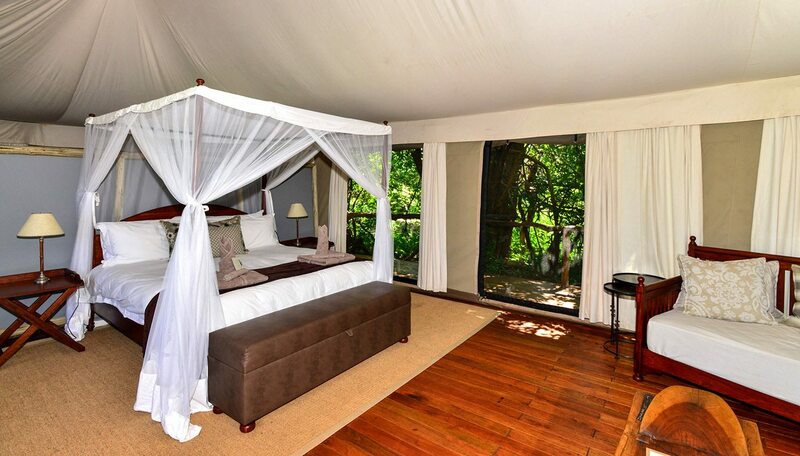 For more information see Kanga Camp, Somalisa Camp and Victoria Falls River Lodge. Kanga Camp proved to be a rather wonderful anomaly. It’s set some 15km back from the Zambezi, in a remote, pristine section of Mana Pools, and is referred to as an ‘inland gem’. Tired from our travels, we spent our first afternoon indulging in the luxury lodge’s famed ‘armchair safari’, watching small herds of elephant coming to drink from two strategically-positioned chairs on a raised deck. Later, after dinner, we sat around a campfire and shared safari tales with other guests over nightcaps, before sleeping soundly in our tent overlooking Kanga Pan. We left the lodge early for our game drive to the banks of the Zambezi, where we exchanged wheels for paddles and a canoe safari. It was a compelling experience – we hugged the fringes of the river, and saw gigantic (and, happily, somnolent) crocodile snoozing on sandbanks, while a pod of hippo noisily crashed down the bank into the water. Later, we beached our canoes and enjoyed a bush brunch under a spreading tree, before a delicious alfresco siesta while our guides kept watch. In the afternoon cool, we took a short game drive along the river, observing elephant several times before heading back to camp.We took advantage of Kanga Camp’s isolation on our last full day, spending our time meandering around the private concession, exploring both the drier areas around the luxury lodge and the landscape of sandbars, islands and small waterholes gradually being revealed as the national park’s four large flooded pools receded. At least, we thought our guide had no specific destination in mind, so we were delighted and surprised when we arrived at a dry riverbed, where a table had been set up for lunch. We traded our tent that night for the lodge’s sleep-out deck, where we slept swathed in mosquito nets and starlight. Kanga Camp proved to be a rather wonderful anomaly. 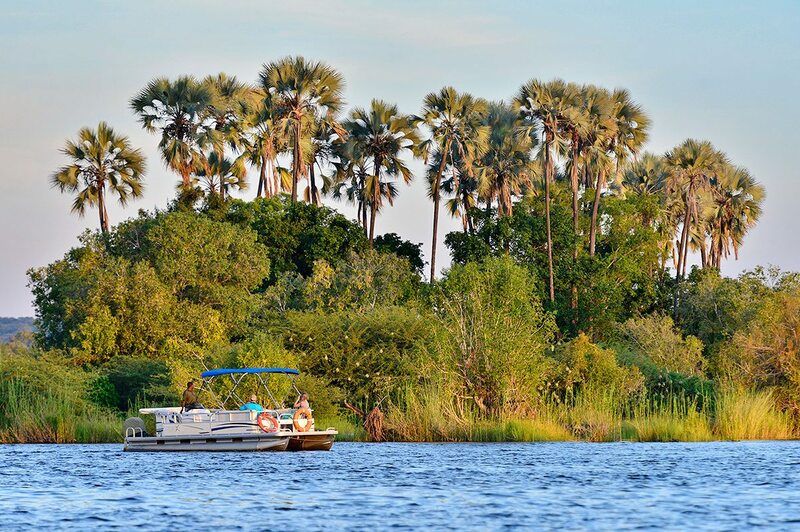 It’s set some 15km back from the Zambezi, in a remote, pristine section of Mana Pools, and is referred to as an ‘inland gem’. Tired from our travels, we spent our first afternoon indulging in the luxury lodge’s famed ‘armchair safari’, watching small herds of elephant coming to drink from two strategically-positioned chairs on a raised deck. Later, after dinner, we sat around a campfire and shared safari tales with other guests over nightcaps, before sleeping soundly in our tent overlooking Kanga Pan. We left the lodge early for our game drive to the banks of the Zambezi, where we exchanged wheels for paddles and a canoe safari. It was a compelling experience – we hugged the fringes of the river, and saw gigantic (and, happily, somnolent) crocodile snoozing on sandbanks, while a pod of hippo noisily crashed down the bank into the water. Later, we beached our canoes and enjoyed a bush brunch under a spreading tree, before a delicious alfresco siesta while our guides kept watch. In the afternoon cool, we took a short game drive along the river, observing elephant several times before heading back to camp. We took advantage of Kanga Camp’s isolation on our last full day, spending our time meandering around the private concession, exploring both the drier areas around the luxury lodge and the landscape of sandbars, islands and small waterholes gradually being revealed as the national park’s four large flooded pools receded. At least, we thought our guide had no specific destination in mind, so we were delighted and surprised when we arrived at a dry riverbed, where a table had been set up for lunch. We traded our tent that night for the lodge’s sleep-out deck, where we slept swathed in mosquito nets and starlight. Our ‘Kanga under the stars’ sleep-out experience ended with coffee as the sun rose. Then we returned to camp for a full breakfast and to prepare for our flight to Hwange National Park. Hwange’s immense spaces provide the perfect backdrop for encounters with major herds of elephant and buffalo, and indeed we encountered an estimated 200 of the latter before we’d even reached Somalisa Camp. We both instantly fell in love with the views from this luxury lodge – perched on an acacia island, it offered panoramas across the savannah (starting to adopt its golden winter hue) all the way Kennedy Vlei. Directly in front of the lodge was the elephant pool, and we whiled away a happy afternoon watching one bull drink, and spotting some 27 of Hwange’s 400+ bird species. Our first game drive from Somalisa Camp gave us a sense of the variety of Hwange’s habitats as we passed through sparse but beautiful Gusu forest with gorgeous Zambezi teak trees, and drove parallel to herds of zebra in the long grass. We were almost intoxicated by the feeling of space and freedom. It felt as though our game drive could go on forever, and we really wouldn’t have minded if it had. Later, on our guided walking safari from the lodge, it was quite a thrill to discover that we were literally walking in the tracks of a lion that had passed that way much earlier. During the night we heard the distant roaring of lion, and discovered it doesn’t so much disturb your sleep as add a frisson of excitement to your safari dreams. Our guide was raring to get going at breakfast, as he now had a good idea where the lion was. Ultimately, it was descending vultures that gave the game away – they were alighting just metres away from where the magnificent, panting lion lay next to the carcass of a young giraffe. 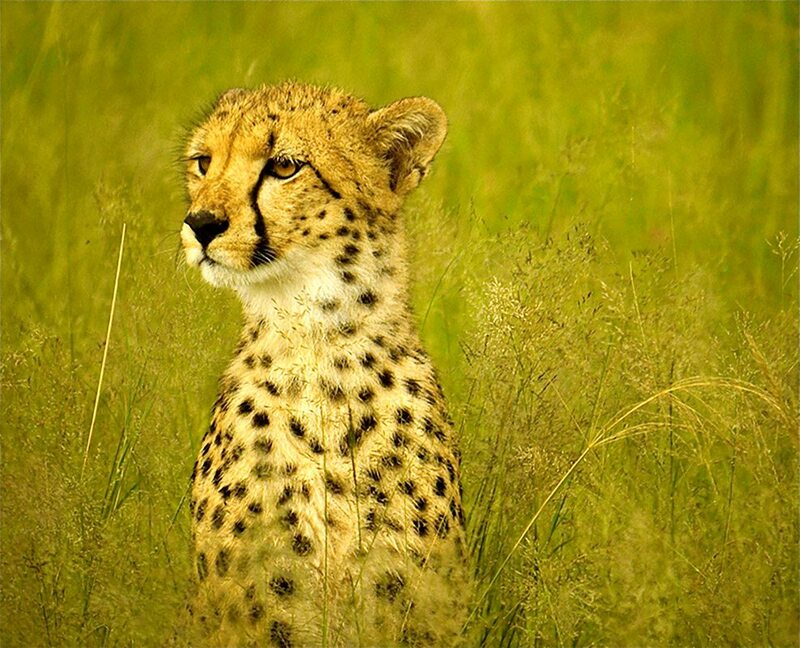 The hunched birds maintained a distance halfway between respectful and resentful, but the lion only had eyes for the pair of spotted hyena which, like us, had followed the birds. Our ‘Kanga under the stars’ sleep-out experience ended with coffee as the sun rose. Then we returned to camp for a full breakfast and to prepare for our flight to Hwange National Park. 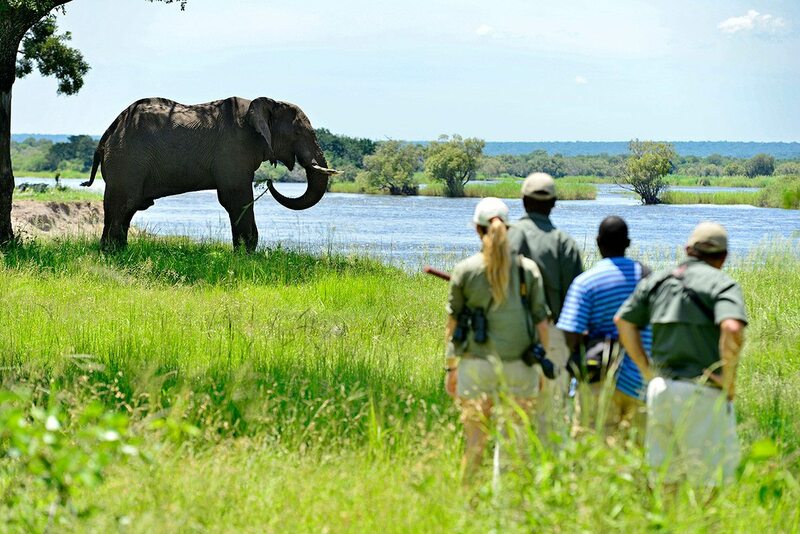 Hwange’s immense spaces provide the perfect backdrop for encounters with major herds of elephant and buffalo, and indeed we encountered an estimated 200 of the latter before we’d even reached Somalisa Camp. 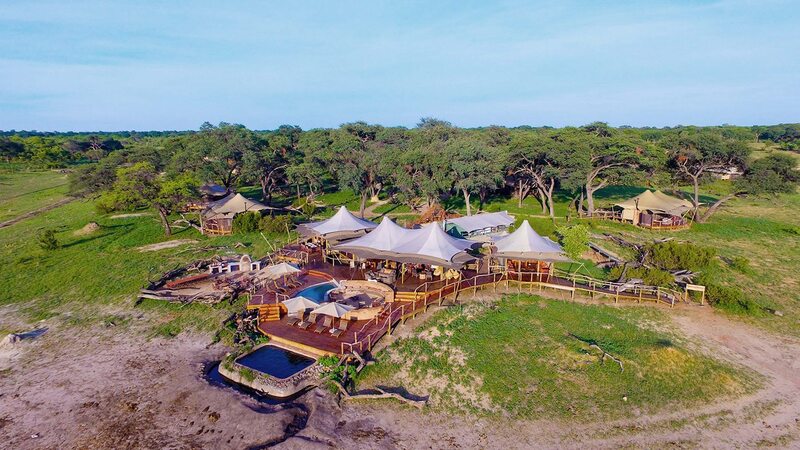 We both instantly fell in love with the views from this luxury lodge – perched on an acacia island, it offered panoramas across the savannah (starting to adopt its golden winter hue) all the way Kennedy Vlei. Directly in front of the lodge was the elephant pool, and we whiled away a happy afternoon watching one bull drink, and spotting some 27 of Hwange’s 400+ bird species. Our first game drive from Somalisa Camp gave us a sense of the variety of Hwange’s habitats as we passed through sparse but beautiful Gusu forest with gorgeous Zambezi teak trees, and drove parallel to herds of zebra in the long grass. We were almost intoxicated by the feeling of space and freedom. It felt as though our game drive could go on forever, and we really wouldn’t have minded if it had. Later, on our guided walking safari from the lodge, it was quite a thrill to discover that we were literally walking in the tracks of a lion that had passed that way much earlier. During the night we heard the distant roaring of lion, and discovered it doesn’t so much disturb your sleep as add a frisson of excitement to your safari dreams. Our guide was raring to get going at breakfast, as he now had a good idea where the lion was. Ultimately, it was descending vultures that gave the game away – they were alighting just metres away from where the magnificent, panting lion lay next to the carcass of a young giraffe. The hunched birds maintained a distance halfway between respectful and resentful, but the lion only had eyes for the pair of spotted hyena which, like us, had followed the birds. As we neared Victoria Falls International Airport in our light aircraft, we saw the cloud of spray rising so high that we joked it would wash the Hwange dust from our wheels. We could see the spray from Victoria Falls River Lodge too, but after settling in and a quick bite we were keen to see the falls up close. An advantage of being here in early winter was that they were still swollen from the rains, and we knew they would be impressive. 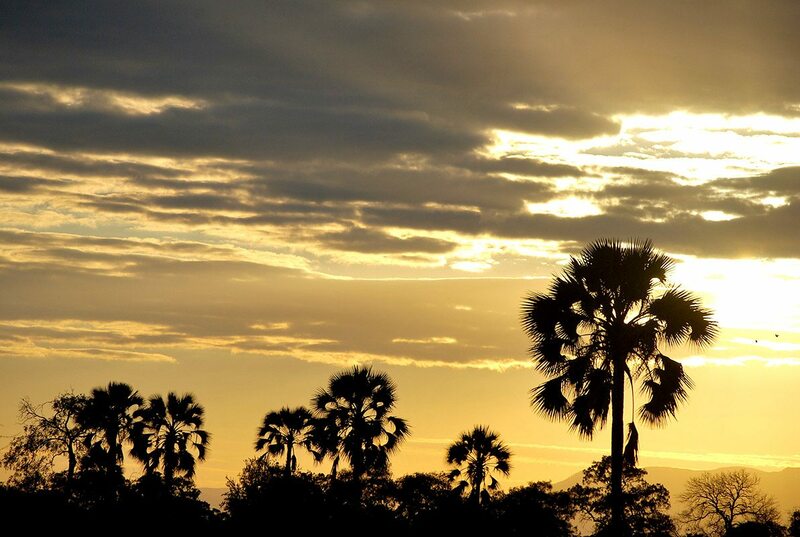 To travel from the dryness of Hwange to the localised rainforest around the falls in a single day was quite perplexing, but the sensory overload of the falls soon dispelled any thoughts, except how magnificent they were. Our cheerful ponchos couldn’t prevent a soaking, but we loved it! As we were once more in a national park, there was no need for the safari experience to end, and we went out for a last morning game drive on our second morning at Victoria Falls. As we tucked into a lazy riverside lunch later, we caught the sun reflecting off microlights in the distance, no doubt circling the falls. We debated going microlighting briefly, but we were enjoying ourselves so much just relaxing that we filed the idea away under ‘N’ for ‘next time’. That afternoon, we engaged with a very different Zambezi River, exploring the much more languid stretch of water above the falls. Our sunset cruise was made even more diverting by an attempt at a hippo census. Trying to count bobbing heads drove us to drink, and we enjoyed several cold Zambezi Lagers while toasting our spectacular luxury safari. As we neared Victoria Falls International Airport in our light aircraft, we saw the cloud of spray rising so high that we joked it would wash the Hwange dust from our wheels. We could see the spray from Victoria Falls River Lodge too, but after settling in and a quick bite we were keen to see the falls up close. An advantage of being here in early winter was that they were still swollen from the rains, and we knew they would be impressive. To travel from the dryness of Hwange to the localised rainforest around the falls in a single day was quite perplexing, but the sensory overload of the falls soon dispelled any thoughts, except how magnificent they were. Our cheerful ponchos couldn’t prevent a soaking, but we loved it! As we were once more in a national park, there was no need for the safari experience to end, and we went out for a last morning game drive on our second morning at Victoria Falls. As we tucked into a lazy riverside lunch later, we caught the sun reflecting off microlights in the distance, no doubt circling the falls. We debated going microlighting briefly, but we were enjoying ourselves so much just relaxing that we filed the idea away under ‘N’ for ‘next time’. That afternoon, we engaged with a very different Zambezi River, exploring the much more languid stretch of water above the falls. Our sunset cruise was made even more diverting by an attempt at a hippo census. Trying to count bobbing heads drove us to drink, and we enjoyed several cold Zambezi Lagers while toasting our spectacular luxury safari. 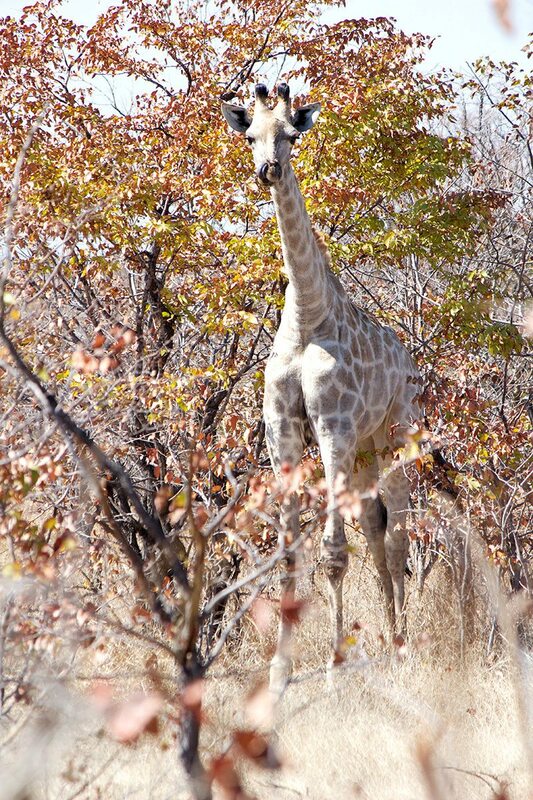 Our luxury Zimbabwe safari helped us understand the delicately-balanced ecology of this wonderful country. Any concerns we may have had about the country’s recent political history were soon forgotten, dissolved in the first of many warm, genuine smiles we received. 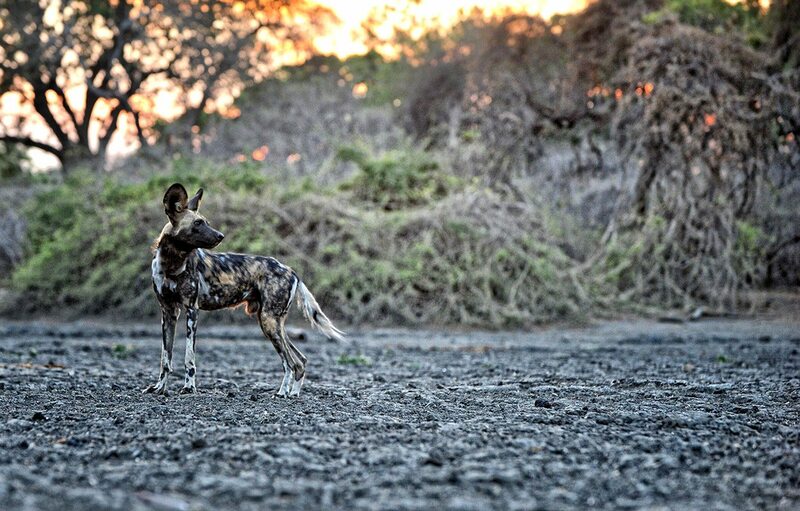 Zimbabwe was one of the countries where the modern notion of a photographic (as opposed to a hunting) safari began, and it’s still home to some of the best guides in the business. Despite the difficulties in urban areas, they clearly took great pride in their nation’s conservation efforts, and couldn’t wait to share them with us. After careful consideration, we’d timed our trip to be early in the Southern African winter, which meant that we got to enjoy the best of both worlds. There were still very significant volumes of water tumbling over the falls, while in the Lower Zambezi, water levels were beginning to fall, revealing a dreamy world of islands and sandbars. This drying out period was most apparent in Hwange, where we saw how the few remaining waterholes would become even more important as the largely rain-free winter progressed. Seeing how the availability (or otherwise) of water had such a profound impact on not just animal behaviour, but also on the landscapes, gave us a greater appreciation for this precious resource, and we both realised that we’d started turning off the taps when we brushed our teeth, and taking shorter showers – a habit we continued back home. 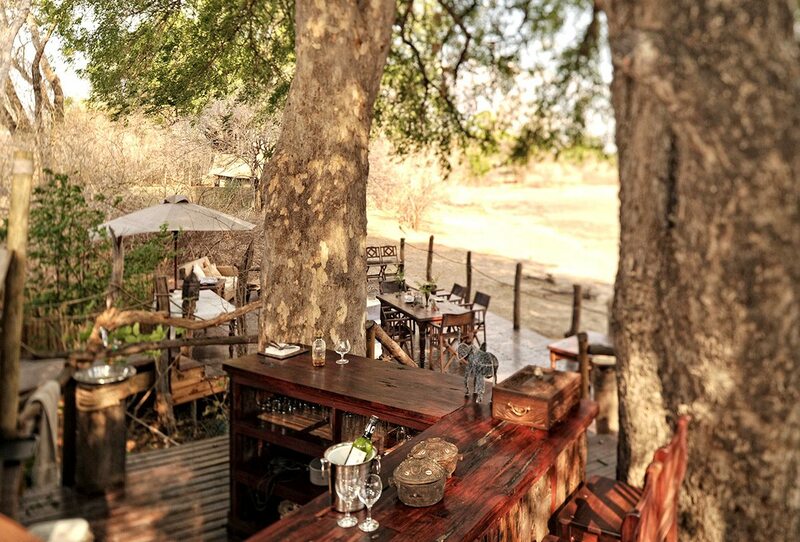 Our luxury Zimbabwe safari helped us understand the delicately-balanced ecology of this wonderful country. Any concerns we may have had about the country’s recent political history were soon forgotten, dissolved in the first of many warm, genuine smiles we received. Zimbabwe was one of the countries where the modern notion of a photographic (as opposed to a hunting) safari began, and it’s still home to some of the best guides in the business. Despite the difficulties in urban areas, they clearly took great pride in their nation’s conservation efforts, and couldn’t wait to share them with us. After careful consideration, we’d timed our trip to be early in the Southern African winter, which meant that we got to enjoy the best of both worlds. 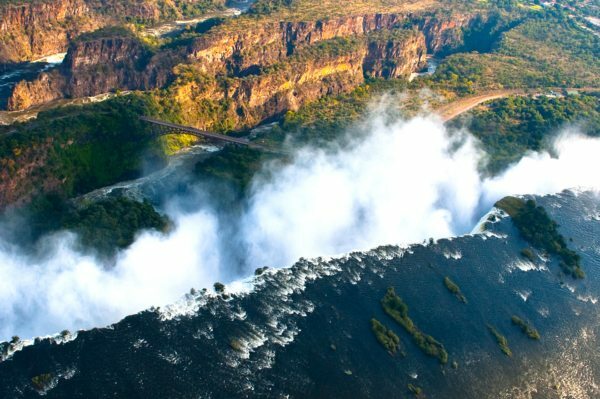 There were still very significant volumes of water tumbling over the falls, while in the Lower Zambezi, water levels were beginning to fall, revealing a dreamy world of islands and sandbars. This drying out period was most apparent in Hwange, where we saw how the few remaining waterholes would become even more important as the largely rain-free winter progressed. Seeing how the availability (or otherwise) of water had such a profound impact on not just animal behaviour, but also on the landscapes, gave us a greater appreciation for this precious resource, and we both realised that we’d started turning off the taps when we brushed our teeth, and taking shorter showers – a habit we continued back home. You’ll be met as you disembark from your international flight at Victoria Falls International Airport, and assisted through customs and immigration. After a scheduled light-aircraft flight to Mana Pools, you’ll take a transfer to Kanga Camp, where you’ll spend three nights. 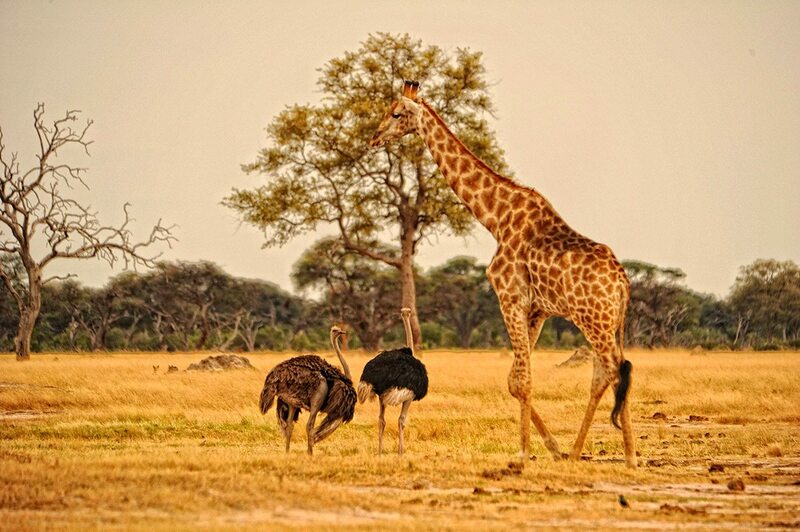 After a transfer from Kanga Camp to the airstrip, you’ll take a scheduled light-aircraft flight to Hwange. 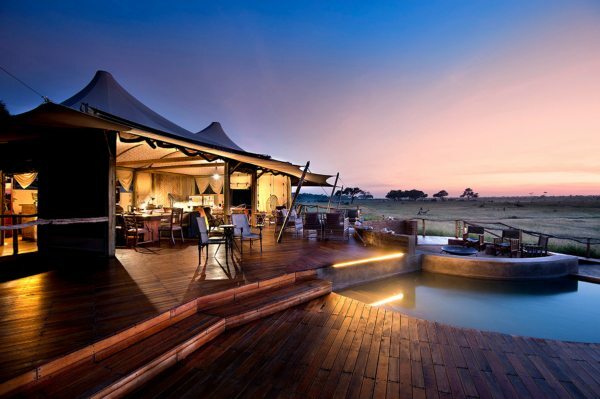 A transfer will take you to Somalisa Camp, where you’ll spend three nights. After a transfer from Somalisa Camp to the airstrip, you’ll take a scheduled light-aircraft flight to Victoria Falls. 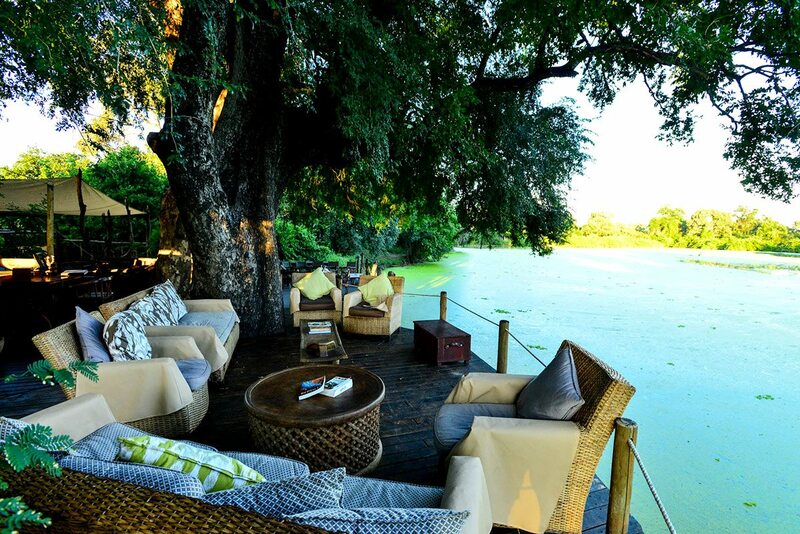 A transfer will take you to Victoria Falls River Lodge, where you’ll spend two nights. A transfer will take you from Victoria Falls River Lodge to Victoria Falls International Airport, to connect with your international flight. Most of the luxury Zimbabwean safari lodges in Mana Pools are on the banks of the Zambezi River, but Kanga Camp is different. 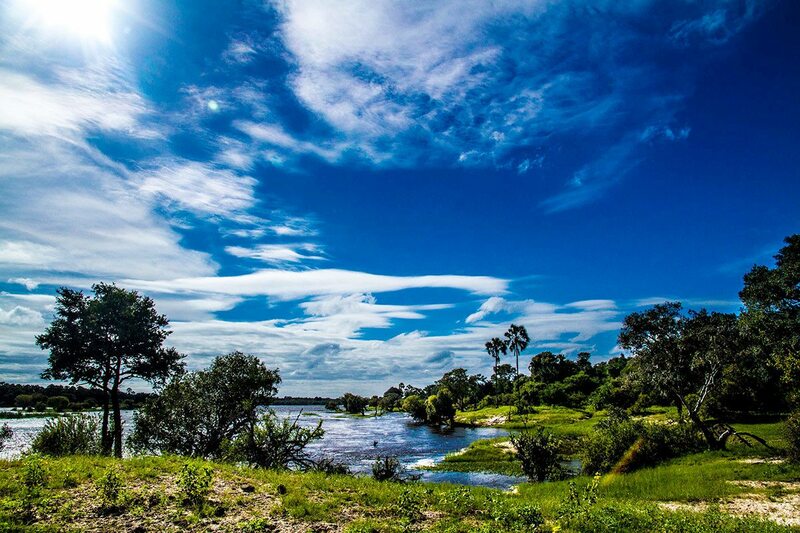 An inland gem, it’s situated by a remote permanent water source, with busy game-viewing from the lodge as well as opportunities to explore the surrounding forests.